Gunatitanand Swami was born as Mulji Sharma in the town of Bhadra in Gujarat. His father was Bholanath and his mother was Sakarba. From his childhood, he had the ability to see what Bhagwan Swaminarayan was doing in Chhapaiya, in North India with his inner eyes. 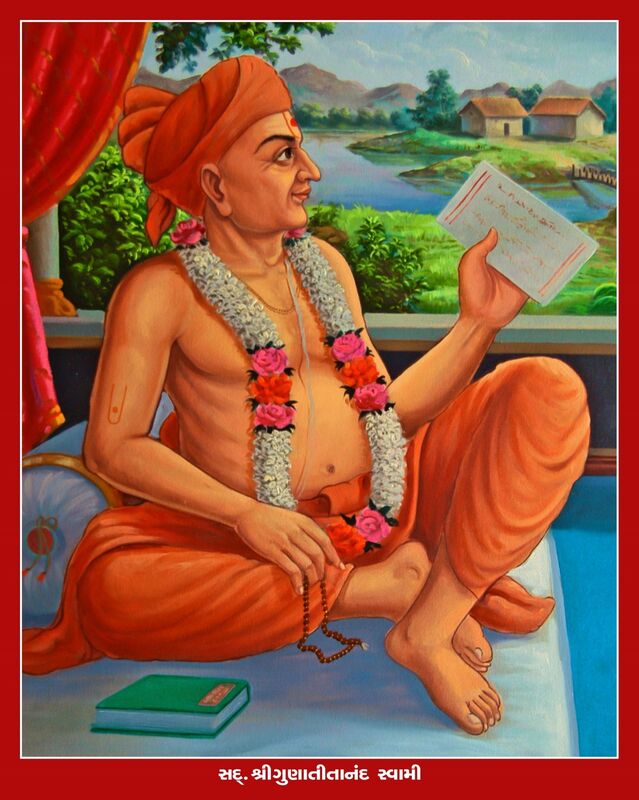 In Samvat Year 1865, after receiving the divine vision and inspiration of Bhagwan Swaminarayan, Gunatitanand Swami left worldly attachments behind and renounced his home instantly. He was initiated as a saint by Bhagwan Swaminarayan in the Samvat Year 1866 during the Dabhan ceremonial sacrifice. He was then given the unique name Gunatitanand Swami. 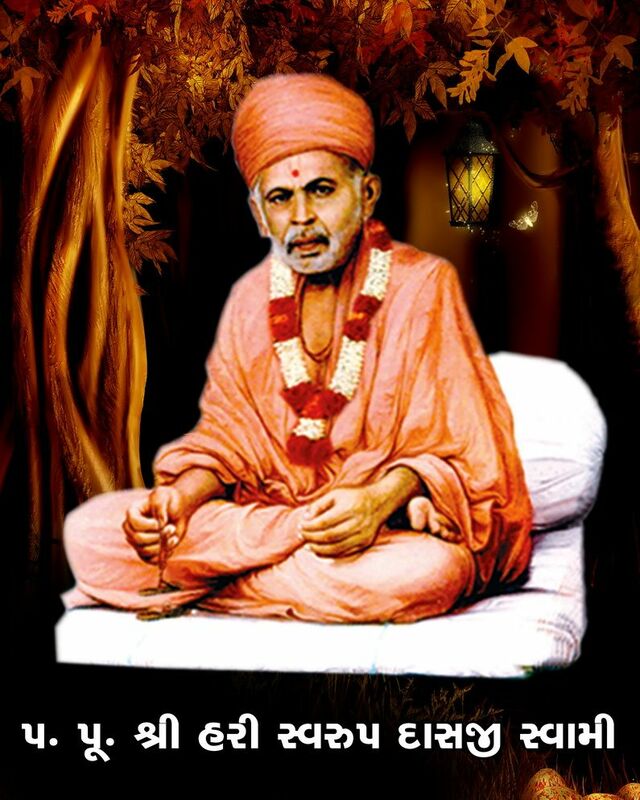 Gunatitanand Swami possessed all of the saintly virtues. He lived a very simple but highly spiritual life, full of service. Bhagwan Swaminarayan was highly pleased with him because of his ever readiness to serve the sick saints, thus setting an ideal example for others. Later on, he was appointed as the head of the Junagadh Temple in Samvat Year 1841 by Bhagwan Swaminarayan. Sadguru Swami Balmukunddasji, the disciple of Sadguru Gunatitanand Swami was also a powerful saint, having extraordinary divinity. He was born in the village ‘Kalej’ in Saurashtra on the third day of Chaitra in the V.S. 1887. His name was Gordhanbhai. From the childhood, he had an inclination towards devotion to God. Coming in contact with Gunatitanand Swami, there was the inner inspiration to renounce the home. Soon after his initiation as a saint in V.S. 1909, Yogiraj Gopalanand Swami blessed him and forecasted that he would be highly capable to shoulder the responsibility of it's of sampradaya. 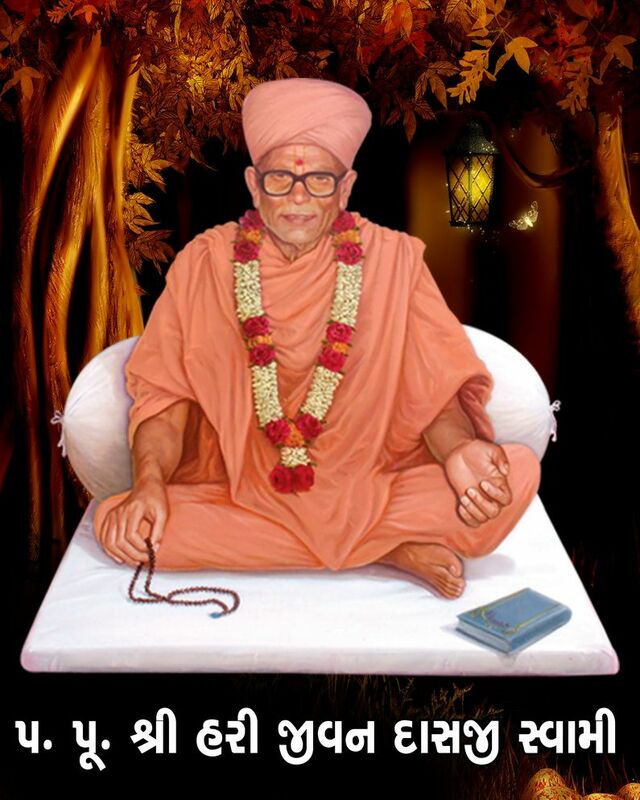 Acharya Maharaj Shree of Vadtal had high regards for Swamiji on account of his extraordinary calibre. He had undergone severe penance and was strictly following the Code of Conduct for Saints as prescribed by Bhagwan Swaminarayan. He had unshakeable faith in Bhagwan Swaminarayan as the Supreme Lord. Hariswarupdasji Swamiji possessed sweet persona, with a pleasant behaviour, along with it Swamiji had a deep knowledge about the Sanskrit language. Many saints took lessons of Sanskrit from Swamiji and people from far distant villages used to visit Swamiji just to listen to his sermons and preachings. The teachings of Swamiji touched the hearts of the people. Swamiji in his preachings used to describe God in a very splendid way. In people used to feel heavenly pleasures, the presence of Swamiji and his sermons. 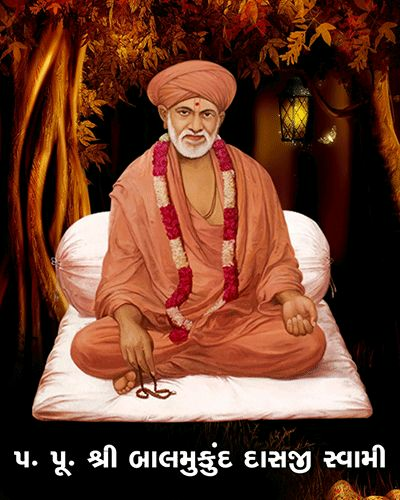 Hon’able Swamiji dedicated his entire life in the service of ‘Swaminarayan and His Saints and devotees,’ and because of his immense devotion towards Lord Swaminarayan, Swamiji experienced many miracles in his life. It so happened that once in the month of hot summer, Swamiji Hariswarup Dasji along with devotees started his journey for Mansa_(a village of Saurashtra), and on the way, they kept on singing Holy Choirs of Swaminarayan. Pujya Harijivan Swami was born on Vikram Samvat 1972 at ajsamadhiyala a village of Saurashtra in ajkot district. His father’s name was Arjanbhai and mother’s name was Kankuben. He had a keen friendship with God since his childhood. Going to temple for Darshan, reciting the prayer and religious rhymes at school and meditating in his free time when others his peers were busy in sports and games were some of the gods blessed spiritual traits could easily be enticed in him. With God’s wish, his father died in his childhood and he and his mother settled at his maternal uncle’s home. His maternal uncle’s name was Manjibhai who is the follower of Lord Swaminarayan. Being a true disciple of Swaminarayan, the Saints had occasionally visited his home. Naturally, Devji’s very devotional soul awaked in the spiritual and holy ambience of his maternal uncle. Meanwhile, he met Pujya Shree Hariswarup Dasji Swami and engaged in his service.